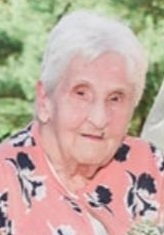 Obituary for Mildred (Fiumara) Findling | McIlvaine-Speakman Funeral Home LTD.
Mildred Findling, 90, of Houston, died peacefully in her sleep, Sunday, July 1, 2018 in the home of her granddaughter, Samantha. She was born January 29, 1928 in Noel, PA a daughter of John and Bessie May Redman Fiumara. Mildred was a homemaker who dedicated her life to raising her children and helping with her grandchildren. She enjoyed collecting knickknacks and sitting on the porch. Surviving are four daughters, Sandra Chase (Bruce) of Allison Park, Nancy Zavatski of Houston, Renee Findling (Jeffrey Young) of Cleveland, OH and Lorraine Findling of Houston; a son, Timothy Findling of Austin, TX; former daughter in law, Pamela Myers of Charlotte, NC; the granddaughter she raised and lived with, Samantha Findling; 9 other grandchildren; 20 great grandchildren; six great great grandchildren; and many nieces and nephews and her dog. She was the last of her immediate family, four brothers and 11 sisters and a son Samuel Findling are deceased. Friends will be received from 6 to 8 Thursday, 2 to 4 and 6 to 8 Friday in the McIlvaine-Speakman Funeral Home Ltd., Robert K. McIlvaine, Onwer/Supervisor, 27 Cherry Ave., Houston, PA 15342, where services will be held at 11:00 am, Saturday, July 7, 2018. Interment will follow in Washington Cemetery.